Boats light up NYC harbor on Saturday night. 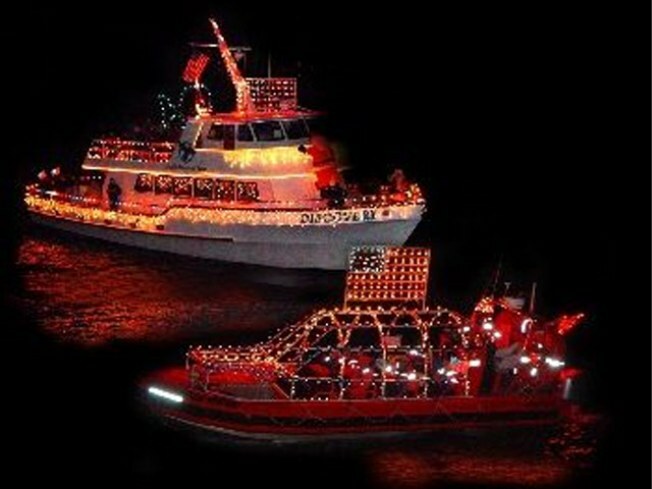 GLOW: If you’re not all paraded out from Thursday, we recommend bundling up as NYC’s tour vessels promenade in holiday finery for Saturday night’s Second Annual New York Harbor Lighted Boat Parade. The fleet will muster on the West Side of Manhattan near Pier 66 at West 26th Street at 6:30PM, then head south and back up along the East side for a full tour of the island. Take a look at the route map to plan your peering. Saturday, 6:30PM. WEB ACCESS: There’s been so much hype and intrigue around the new Julie Taymor-U2 musical SPIDER-MAN Turn Off the Dark, we almost forgot that it debuts this weekend. The show pairs the direction of The Lion King’s Tony-winning Taymor (who also wrote the book with Emmy winner Glen Berger) with a score by Bono and The Edge; and visionaries behind such spectacles as Cirque du Soleil and the Olympic opening ceremonies have created flying and other eye-popping stunts. Postponements, technical glitches and budget overages are (hopefully) all in the past: The most expensive musical ever made (at $65 million) is ready for its close-up at the Foxwoods Theatre (and at this writing, tickets are still available) Sunday, 6:30PM. ON THE SPOT: Asssscat 3000: Curious name, but indubitable comedy pedigree for this show at the Upright Citizens Brigade Theatre: On Sunday, the UCB crew will be joined in an evening of longform improv by names from the SNL ranks, such as Amy Poehler and Horatio Sanz (and no doubt others who’ll show up unannounced, in the way these things tend to happen). Also? Bargain! The first show is only $10, and the second is free. Sunday, 7:30, 9:30PM, with additional dates in December.